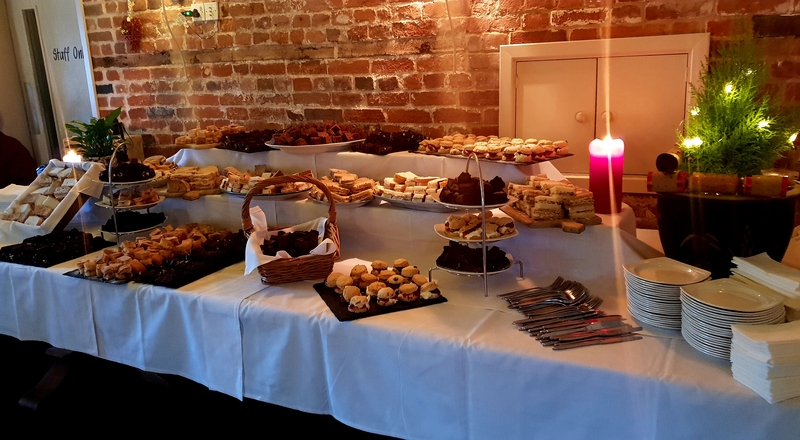 We can host parties of up to 60 people for a sit down meal in our Stables function room or up to 100 for a standing buffet with some seating. You will have your own dedicated members of the team who will look after your party throughout, from arrival to departure. You can create your own menu for the party by picking 3 dishes from each course of the Stables function menu list. The host picks three starters, three main courses and three desserts to create a menu from which the guests can then choose. We will require a pre- order list (on the sheet which we can provide) which shows what each guest has ordered and a table plan, which we will provide. To assist you, if you would inform us of the choices you would like, we can send you a table plan and order sheet and prepare menus which you can send to your guests. If you have anyone in your party with special dietary requirements, please inform us. For vegetarian diners we have a selection of dishes available from which they can choose. Create your own buffet from our menu choosing either 5 options, 7 options or 9 options priced accordingly. Each buffet will have the main table laid with white table clothes and a number of tables positioned round the room which can be discussed prior to your event. We can arrange for Prosecco or Champagne on arrival and have an extensive wine list for you to choose from for your guests. Bottled beer packages can also be arranged. We would suggest that you choose wine and any pre-meal drinks in advance from our wine list, in order that we can ensure we have sufficient stock. If you would like any advice or assistance, please do not hesitate to contact us. A non refundable deposit of £100.00 is required to secure your booking. We stayed two nights, as we were attending a funeral. I was with my mother who is 84. The staff were very helpful and attentive.